‘The states of the heart, one should know the praiseworthy qualities which one must adopt, and the blameworthy qualities which one must avoid. As for the praiseworthy traits, they include reliance on Allah, sincerity for Him, praise and thankfulness for His blessings, repentance from one’s sins, fear, hope, abstinence, love, patience, pleasure with His decree, and the remembrance of death. This entry was posted in A. Reality of Tasawwuf, B. Praise worthy morals, C. Blame worthy Morals, E. States, K. Fiqh on April 24, 2018 by 'abd. This entry was posted in C. Blame worthy Morals, E. States, H. Whispering & random thoughts, N. Advice, T. Tarbiyet on April 9, 2018 by 'abd. (One should contemplate that) throughout his existence he has been subjugated to terrifying diseases and dangers and various bodily challenges; he gets hungry and thirsty, falls sick and eventually dies-all against his wishes. He desires to know something but does not, he wishes to remember something but cannot, he wishes to forget something but cannot, he delights in food that harms him, and hates medicine which restore his health. At no moment in the night or day is he safe from being stripped of his hearing, sight, knowledge, or ability; his limbs may be paralyzed, his intellect destroyed, and his very life dissipated. He is a mere slave with no power over himself or others. And this is the middle of his affair. As for his end, he returns to his original state, a lifeless object; then he is placed in the dirt and becomes a filthy carcass just as he began as a filthy drop of sperm; his body decays and is eaten by worms, and becomes dirt, which is cultivated and built over. And if only this were the end! How fine would his state be if he remained dirt! But he is brought back to life to bear the severity of the Day of Judgment and its horrors; then he will enter the fire unless his Lord has mercy on him. (In spite of all these how foolish it will be to act arrogantly). This entry was posted in C. Blame worthy Morals, E. States, F. Zikir & fikr, N. Advice, T. Tarbiyet on March 31, 2018 by 'abd. ‘It is relatively easier to make ‘itekaf (of the last ten days of Ramadan), offer numerous supererogatory (nafil) salah, recite the whole Quran daily, perform many Umrah and Hajj. However, the real feat is when it comes to leaving the sinful activities. This is the real achievement and mark (of true religiosity). To have control over the sinful desires of nafs. To be steadfast at the time of temptation. Being cognizant of the commands of Allah. This entry was posted in C. Blame worthy Morals, D. Acts of Worship, F. Zikir & fikr, K. Fiqh, N. Advice, Repost, T. Tarbiyet, W. Wird & wazaif, Z. Mustahebbat on February 5, 2018 by 'abd. A seeker wrote, laziness and heedlessness persists. I humbly request for prayers (dua) for determination (himmat). This entry was posted in C. Blame worthy Morals, D. Acts of Worship, H. Whispering & random thoughts, N. Advice, T. Tarbiyet on January 27, 2018 by 'abd. ‘You must seclude yourself from people, for they will preoccupy you from the worship of Allah Most Exalted. Nay, they will prevent you from it altogether! Please, note involvement in social media via internet is doing this in our era. This entry was posted in C. Blame worthy Morals, H. Whispering & random thoughts, J. Rights , N. Advice on January 5, 2018 by 'abd. “Verily, (from the) first people to be judged on the Day of Resurrection will be a man who was martyred. He will be brought, the blessings of Allah will be made known and he will acknowledge them. Allah will say: What did you do about them? The man will say: I fought in your cause until I was martyred. Allah will say: You have lied, for you fought only that it would be said you were brave, and thus it was said. Then, Allah will order him to be dragged upon his face until he is cast into Hellfire. Another man studied religious knowledge, taught others, and recited the Quran. 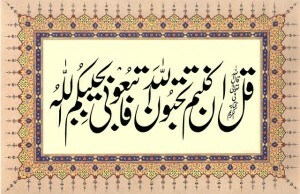 He will be brought, the blessings of Allah will be made known and he will acknowledge them. Allah will say: What did you do about them? The man will say: I learned religious knowledge, taught others, and I recited the Quran for your sake. Allah will say: You have lied, for you studied only that it would be said you are a scholar and you recited the Quran only that it would be said you are a reciter, and thus it was said. Then, Allah will order him to be dragged upon his face until he is cast into Hellfire. This entry was posted in B. Praise worthy morals, C. Blame worthy Morals, D. Acts of Worship, J. Rights , S. Sunna, Z. Mustahebbat on January 1, 2018 by 'abd. Who are the dead? He was asked. This entry was posted in C. Blame worthy Morals, N. Advice, Uncategorized on December 25, 2017 by 'abd. everyone is impressed by their own opinion. Then you must take care of yourself and leave the common people. Verily, ahead of you are days of patience in which patience will be like grasping a hot coal. This entry was posted in B. Praise worthy morals, C. Blame worthy Morals, N. Advice, S. Sunna, T. Tarbiyet on December 12, 2017 by 'abd. It is absolutely vital for one to constantly remain vigilant and cautious regarding his nafs. The nafs is such that if it finds the opportunity and the means to fulfil its desires, it will never rest until it gets what it wants. In fact, even those who have progressed sufficiently in the path of self reformation, it is nevertheless, dangerous for them as well to become complacent and relax their guard regarding the nafs. However, the difference with them is that due to their knowledge and experience in traversing the path of self reformation, it is not as difficult for them to bring their nafs under control at the time of danger. The condition of our nafs is like that of a stubborn horse. When it is let loose, it neither looks forward nor backward (as it is out of control and runs in any direction without thinking). In this state, the damage that the nafs can cause is so serious that we cannot truly comprehend it. This entry was posted in C. Blame worthy Morals, H. Whispering & random thoughts, J. Rights , N. Advice, T. Tarbiyet on December 1, 2017 by 'abd. Abu Usman Hairi wrote to Mohammed bin Fazal (Allah have mercy on them) inquiring about the signs of spiritual infliction and depravity (شقاوہ). 1. The knowledge is present but there is deprivation from action (according to it). 2. The actions are present but they are void of sincerity. This entry was posted in A. Reality of Tasawwuf, C. Blame worthy Morals, D. Acts of Worship, N. Advice on October 11, 2017 by 'abd.